In many places across the country, both saltwater and freshwater fishing is a year-round endeavor with a wide variety of tackle. When heading out on a fishing excursion, many tactics are universal, in that they can be applied anywhere from the neighborhood pond to the bluewater fishery offshore. Hands down, inshore saltwater fishing is the most popular saltwater fishing largely due to its relatively low cost and accessibility. Starting at the shoreline, surf fishing, depending on the locale, accounts for fish such as croaker, Spanish mackerel, bluefish, pompano, red drum, snook, tarpon and more. Bait fishing with heavy sinkers for long casts with specialized surf rods is predominant, though light-tackle anglers cast lures and flies in the wash near the sand. Many winter tourists prefer this style of saltwater fishing. Coastal tackle shops carry the right baits, such as live and fresh-dead shrimp, live crabs, squid, sand fleas, and the latest info on the best action on hundreds of public-access beaches. Coastal bays and tidal rivers are perhaps the epicenter of the inshore fishery for most small-boat anglers or those who fish from shore or wade on shoreline flats. Light tackle with live bait or artificial lures such as topwater plugs, jigs, spoons, and soft-plastic baitfish and shrimp imitations are productive when cast with light tackle over grassflats, oyster bars, around bridges, docks and similar manmade structures. Spinning tackle, baitcasting and fly tackle are equally suitable. Spotted seatrout, red drum, snapper, jack crevalle, flounder, pompano, snook, tarpon, bonefish, permit and other gamefish can be targeted seasonally. Nationwide you will find lakes, streams and manmade canals that team with everything from panfish to exotic and sometimes invasive species. Panfishing is done with live baits, such as crickets and worms fishing via cane pole or ultralight spin gear, though small lures and flies can be deadly. Bass take a wide variety of plastic lures, topwater plugs and flies. Invasive species, such as cichlids and snakeheads, are now targeted for sport, and the purposely introduced peacock bass (to control the population of invasive fish) is a most popular species that many consider, pound-for-pound, the hardest-fighting fish in certain fresh waters. They prefer fast-moving artificial finfish lures, and take store-bought shiners, too. Canal banks provide public property access to anglers on foot, though many lakes and streams require a boat to access the best fishing. The term deep sea fishing is used to refer to fishing anywhere from coral reefs and manmade artificial reefs and wrecks within a few miles of the Atlantic coastline to the Gulf Stream and beyond. On the Gulf Coast, anglers must venture much farther offshore due to more gradual depth increases per mile. This fishery can be accessed by even smaller boats when sea conditions allow. Fishing with freelined live bait or bottom rigs accounts for many species of snapper and grouper, amberjack, cobia, permit, black sea bass and king mackerel. This is normally the place for medium to heavy conventional (20- to 50-pound-class) tackle. In blue water, and in waters 120 feet or more along the Gulf, trolling with natural rigged baits and big lures accounts for mahi-mahi, sailfish, wahoo and the occasional blue marlin and swordfish. Other than trolling, the same species can be caught while drift-fishing and kite-fishing with live baitfish. Charter-wise, private captains on everything from so-called headboats (typically carrying 15 or more people) to six-person sportfishers are the best bet for anglers seeking a charter, with the occasional captain fishing from a 20- to 30-foot open-center console boat. Nighttime trips often provide the best reef-fishing action for snapper and grouper, and swordfish, not to mention angler comfort, during the height of the summer. Tackle ranges from 3- to 13-weight fly rods, with the larger number designating the heaviest class of gear. A 9-weight fly rod might be the best all-round outfit, and it can be used for bass, red drum, snook, seatrout, small tarpon, bonefish, jack crevalle, pompano and many others, and most importantly, can cast the flies that are typically used for those species. Fly fishing in is some parts of the country is largely done with standard floating fly lines due to the shallow nature of inshore waters. In deeper waters, sinking fly lines present streamer flies to fish holding at any depth. The list of effective fly patterns fill entire books, but in general, most flies imitate major prey species – shrimp, crabs, baitfish, eels – and for fresh water – bass and panfish, they are tied to imitate frogs and insects, too. Spearing is generally defined as: the catching or taking of a fish by bow-hunting, gigging, spearfishing, or any other device that's piercing its body. For those who want to take fish by this method, spear fishing has been compared to hunting. 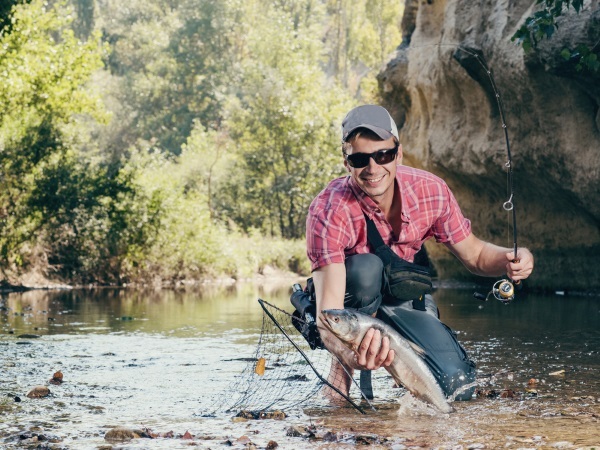 Like all recreational fishing, fishing with spearguns is highly regulated – many species of fish and shellfish that are legal for hook-and-line anglers or divers using collecting methods other than spearguns are not permissible for harvest with this gear. And there are established zones, where spearfishing is prohibited. Spearfishers choose between snorkeling and scuba diving with tanks, depending on depth. Traditional spearguns and Hawaiian slings are most popular, and are ideal for taking bottom fish such as snapper, grouper, and the highly popular, good-eating hog fish. Many intrepid spearfishers have taken to blue water hunting offshore to hunt pelagic species such as mahi-mahi, small tuna, cobia and king mackerel and wahoo. Dive shops are more prevalent now than ever in some areas, with coastal locations that cater to spearfishers; and there are increasing numbers of dive operations that take out multiple customers who are certified in scuba. Many of the rules and regulations that apply to hook-and-line fishing also apply to spearfishing. There is no denying that certain waters are blessed with a plethora of resident and migratory (pelagic) species. Everything is seasonal – there are peak times which successful anglers take advantage of. Black crappie, bluegill and shellcrackers are highly sought for their food value. Freshwater invasive species include cichlids of all kinds. In salt water, the red drum and spotted seatrout top the popularity chart. In between, saltwater inshore species such as pompano, mangrove snapper, flounder, sheepshead, croaker, tripletail, Spanish mackerel, cobia, bluefish and whiting garner much attention, as food fish primarily, though many anglers release most fish after a few are in the cooler for a fresh fish dinner. Top gamefish that are released either due to laws, or due to low food value, would include tarpon, bonefish and large jack crevalle and barracuda. Farther offshore, red snapper, mutton snapper, gray snapper, black and gag grouper, wahoo, mahi-mahi (dolphin fish), swordfish and highly migratory species such as blackfin and yellowfin tuna attract a growing number of anglers willing to make longer trips offshore.